​Note: Mestaruussarja (Championship) winners in 1969. The Kokkolan Palloveikot football club was established on October 12, 1930 at the Maxim Café on Isollakatu. The founders were young men from Cologne who wanted to make it possible for Finnish-speaking boys to play football. The first decade enabled KPV to build a foundation and by 1938 the club was already developing its junior activities which continued during the war years. In the late 1940's the club participated in the Second Division (SPL Suomensarja) - North Group (Pohjoislohko) or West Group (Länsilohko) - but were relegated at the end of the 1952 season to the Third Division (Maakuntasarja) where the club oscillated between the two grades. There were good individuals such as Hannu Vainio who was perhaps the most prominen playert. Towards the end of the decade, youth work began to produce results at the national level, when A-juniors in 1956 reached the first SM-sarja. KPV had a successful time in the late 1960s and early 1970s. Between 1969 and 1975, KPV won one SM-sarja gold, one SM-sarja silver and two SM-sarja bronze. On two occasions KPV participated in Europe including the European Cup seasons of 1970-1971 and 1974-75. Celtic won their two matches against KPV 14-0 on aggregate with the scores 9–0 and 5–0. FC Köln were also tough opponents and KPV were defeated 4-1 in Kokkola and 5–1 away from home. In the 1980s KPV competed in both the Championship (SM-sarja) and First Division (1. divisioona). Unfortunately, the club went into financial difficulties reflecting a number of factors. However, on the youth development front the club progressed. The name of the club appeared with the letter "J" on official papers as the result of debt restructuring in the 1990s. The team of junior coaches took on great responsibility at this stage, and their work was a welcome boost given everything that had happened. The first team competed in the First Division (1. divisioona) and Second Division (2. divisioona), the latter being the third tier of Finnish football. At the end of 2000, KPV celebrated its first 70 years as a club. In 2001, the club launched its first website. The Finnish Football Association awarded the KPV academy status in 2002. The folllowing year the club began developing women's football again. In the same year, the B-juniors of the club took SM bronze medals. In December 2013 the club was restructured with KPV's first team being incorporated into a new company, while KPV's junior association continues as a separate entity. At the end of the 2015 season, KPV gained promotion to First Division (Ykkönen)and at the end of the 2016 season finished in fifth place. 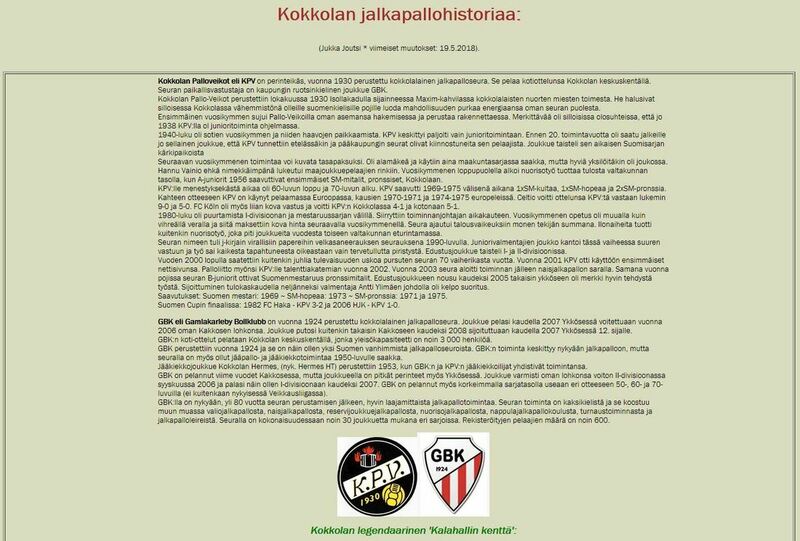 At the beginning of 2017, KPV-yhtiöt Oy (the club's backers) announced that goal for the season was promotion to Veikkausliiga or that the company would withdraw its support. However, at the end of the period, the company's principal shareholder, Matti Laitinen, announced that it would continue to operate after a very successful period. KPV finished third in the second tier league just ten points away from the Promotion Playoff for the Championship (Veikkausliiga). After a break of almost 30 years, KPV gained promotion to the Veikkausliiga at the end of the 2018 season,the club securing a top place on away goals with a Promotion Playoff with TPS Turku. KPV's home stadium Kokkolan keskuskenttä was opened in 1935. It has a total capacity for around 3,000 spectators, with cover for 700 people. There is no floodlighting or under-soil heating. As the ground does not comply with current Veikkausliiga standards it is hoped that the City Government will support the upgrading of facilities.